Washington Monthly | Just How White Is Education Journalism — & How To Encourage More #edJOC? Just How White Is Education Journalism — & How To Encourage More #edJOC? In honor of Black History Month, this year’s debate over #OscarsSoWhite, and the annual EWA national conference on education journalism coming up this spring, I asked around a few education newsrooms to find out how things were going on the racial diversity front. 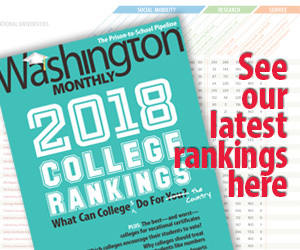 What seems clear from these initial anecdotal results is that the education beat may be lagging behind in the industry-wide push to diversify editors and reporters who are covering the nation’s schools and communicating what’s going on to the larger public, and that standalone nonprofit education outlets might have additional challenges even beyond the ones shaping hiring and retention at larger outlets. There are a few bright spots, however, and we’ll know much more when the EWA report on education journalists comes out in a couple of months. According to Kathleen Kennedy Manzo at Ed Week, the full-time editorial staff of 44 includes 12 persons of color – just over 25 percent. According to the PR person at NPR, the NPR education team has 10 employees, of whom 2 are persons of color. One of them is Claudio Sanchez. I’m not sure who the other might be. According to Evelyn Larrubia, KPCC‘s team may be among the most diverse groups of journalists covering education in the country. Three out of four education reporters are persons of color. These likely include correspondent Adolfo Guzman-Lopez, editor Sandra Oshiro, and arts education reporter Priska Neely. Based on reports sent in last year, The San Antonio Express-News and the LA Times might give them a run for their money, though I didn’t query them this time around. The Washington Post’s communications manager says that “we generally do not break out demographics by beat,” but refers to the annual ASNE report, which it does participate in. According to the latest data, the Washington Post’s staff is 31 percent minority. Curious about the makeup of the Post’s education team? I think that three main education reporters (Lyndsey Layton, Emma Brown, and Michael Alison Chander) are white, as is education editor Josh White and higher education reporter Nick Anderson. But I don’t know who covers Fairfax or Montgomery County these days or how they identify. Screengrab of some of Chalkbeat’s staff. As was discussed extensively on the EWA list-serv last year, a reporter doesn’t have to share the race or socioeconomic background of her story subjects in order to do a good job. And the problem may be as much a pipeline problem (attracting and keeping minority education journalists and eliminating unpaid internships and other avenues that reward better-off candidates) as much as anything else. It’s also possible the outside funders who are supporting education journalism have not put much of a priority on hiring journalists of color. You can see some posts about race and education journalism written last spring, focusing on individual journalists rather than outlets/education teams: Bigger List Of Education Journalists Of Color (#edJOC), and White Reporters Covering Students Of Color. This time, the question is about education-focused outlets or teams of education journalists within larger organizations. Want to know more? A more focused survey from EWA is slated to come out in a couple of months. Meantime, here’s a Poynter article about #JournalismSoWhite. You can also read back through my tweets about the issue at #edJOC (education journalists of color).